We are happy to continue our support of Mara Riante Village School in Kenya’s Masai Mara with a contribution towards the building of a further classroom at this community-run school. We have joined hands with the local children’s charity the ABATO Foundation to provide additional teacher’s facilities at the ABATO School in the Mpigi District of Uganda. The High Five Club continues its support this year of our school “Breakfast Clubs”, in the wildlife-rich Masai Mara in Kenya and South Luangwa in Zambia. The provision of one nutritious meal a day means that attendance levels at these schools have soared. The children no longer miss class due to being too hungry to walk to school or in their search for food – the latter contributing to the levels of poaching in these wildlife areas. For details click here Breakfast Clubs 2016 and to see our inspiring video of the feeding programme in Zambia . We are thrilled to share that High Five Club members have contributed towards a ground-breaking new on-the-job teacher training programme in Africa. Teach First is set to raise the bar of secondary school teaching standards in South Sudan, a country that has one of the lowest enrolment rates in secondary education in the world. Give us a High Five Hugo! Working hand in hand with the Burundian NGO Great Lakes Outreach, High Five Club has supported Bravo Ministries with the purchase of a portable Honda generator for their sewing workshop. The new generator means that the women can produce more goods for sale, helping increase their income and enabling them to become self-sufficient and forge a new life for themselves. The generator is allowing young women and girls to be freed from prostitution now and into the future. To read about this initiative click here. High Five Club has joined hands with the Lilongwe Wildlife Trust in Malawi to deliver a fourth year of an innovative “Adult Literacy through Wildlife” programme in Lilongwe. Read about this amazing initiative here. We hope you enjoy reading about our support here. 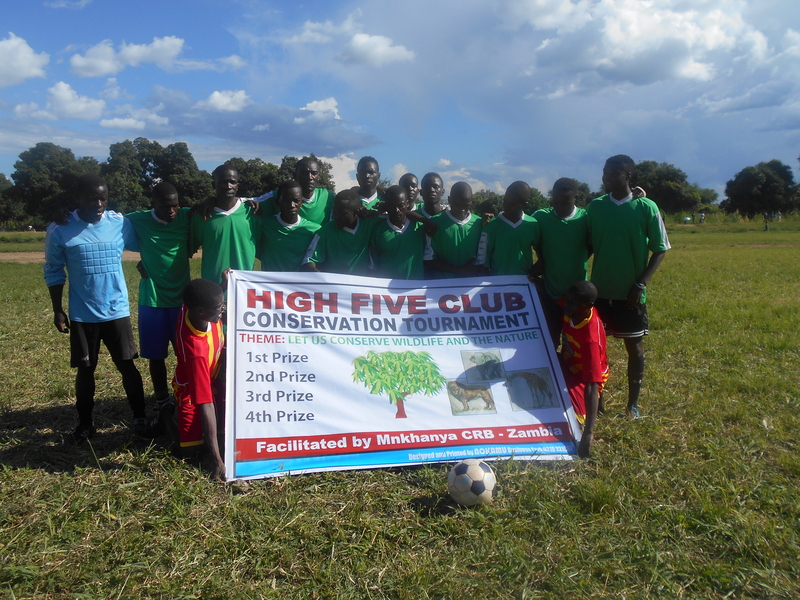 We would like to bring you exciting news of a new football tournament that High Five Club has launched in Zambia’s Luangwa Valley. It is being used to successfully sensitise disengaged male youth re wildlife conservation and important health issues, along with the wider community in this important wildlife area. It has been such a success that we are planning to expand this initiative further in 2016, so do watch this space!! We hope you enjoy reading the project update attached. Such a simple, yet effective initiative. In recognition of the dedication and commitment of teachers at the ABATO School in Mpigi District in providing a quality education for the vulnerable children at this school, we have over the summer supported ABATO to construct 5 teacher’s houses within the grounds of the school. Each house has a bedroom and a living space, with cooking taking place in an outside communal kitchen area.